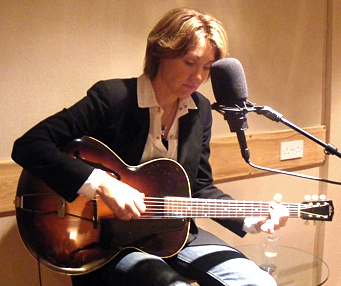 Episode 9 of Propermusic.com’s new series of weekly podcasts features Diana Jones in a live music special. She joins Trevor Dann to discuss her latest album High Atmosphere as she tours the UK. She plays three tracks from the album live in the studio on her 1944 Gibson L-50 guitar and shares with us her love of old-time music. Diana also talks openly about the car crash that changed her life and how she discovered her natural voice and her birth family in the Smoky Mountains. The Propermusic.com Podcast is produced and hosted by award-winning broadcaster Trevor Dann and is available now for free streaming and download through iTunes and SoundCloud.